I have been busy making plum jam. Ingredients: plums, sugar, water. That's all. No glucose-fructose syrup, no gelling agent, no citric acid, no sodium citrate acidity regulator, etc etc, as is found in shop bought jams. And I'm delighted to say that it has set! I was a bit worried about it yesterday because it still seemed runny, but left to cool fully overnight it has now set properly. I've never made plum jam before, so this was a new achievement. The plums were bought in the supermarket, which kind of feels like cheating, but I didn't get so many blackberries this year and I wanted more homemade jam than the two jars of seedless blackberry and 2.5 jars of jostaberry that I've made so far. Actually, we probably did have as many blackberries, but they came ripe in stages so got eaten in pies and crumbles instead of coming ready all at once and thus prompting a jam making session. Also I made the blackberry-and-apple jam seedless this time, so the fruit I did gather on my blackberrying expedition didn't go as far. It's amazing how much of a blackberry is made up of seeds! Oh hurrah! These look lovely. I thriftily got a jar of damson and apple cheese out the squeezings from the pulp I used for the jelly. I know it has all set now - I'm just not sure whether it has turned to rubber. 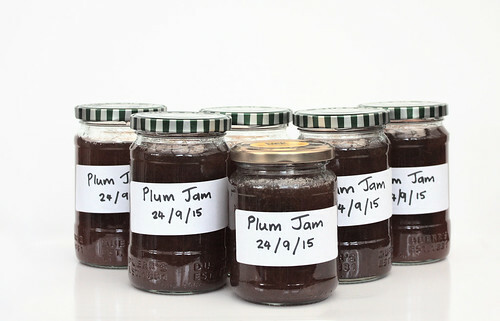 Did you use the plumstones in a bag to help with the pectin? I tried that once and it felt like it worked, but may have just been wishful thinking. I actually just put the plums, along with the stones, into the pan and cooked everything up together, as per the instructions in Mrs Beeton. I did cut the plums in half, but didn't remove the stones. I simmered everything gently for 15-20 minutes, then added the sugar and, once it had dissolved, boiled vigorously, whereupon the stones (as predicted by Mrs Beeton) did indeed rise to the top where they could be fished out one at a time. Possibly having the stones in there helped the jam to set, but as it's the first time I've made plum jam, I don't really know. Aha yes, I vaguely remember my Mum doing it that way years ago. There is always the danger of missing a stone using that method. However, it's just occurred to me that next time I ought to count the plums, then I can count the stones as I fish them out. Then I could be sure I'd got them all. I keep saving jars, for precisely this purpose. Perhaps I could practise a little in winter, with shop-bought fruit? I don't see why you couldn't practice with shop bought fruit. It's not going to end up as cheap as using free fruit picked from the garden or hedgerow, but it should still work out cheaper than buying "homemade" high quality jam.